For decades, vacationers from across the globe have flocked to Florida for its natural beauty, endless sunshine, and countless outdoor activities. One classic ocean-side destination is Cocoa Beach. With all the charm you’d expect from a coastal community, and located close to the Kennedy Space Center in central Florida, Cocoa Beach is a virtual playground for those seeking sun, surf, and sand. Known for its white, sandy beaches and clear, warm water, it is not surprising that it also boasts the title of the east coast’s unofficial surf capital. While relaxing at the beach and enjoying Florida’s fabulous sunshine, there are a number of opportunities to see some of the state’s most iconic wildlife. The Cocoa Beach area has many different species of dolphins, including the intelligent and adorable bottlenose dolphin. Maryellen Kennedy Duckett of National Geographic notes that they are regularly spotted following seabirds and fishing boats in coastal waters. If your goal is to get a good, close look at the bottlenose dolphin in its natural habitat, then arguably kayaking is your best bet. It is quiet and unobtrusive, allowing you to get closer to the animals. Kayaking eco-tours facilitate an intimate connection to nature. As you paddle along the coastline with clear, glassy water beneath and that endless Florida sunshine above, you will feel a rising elation that comes from being somewhere naturally beautiful. 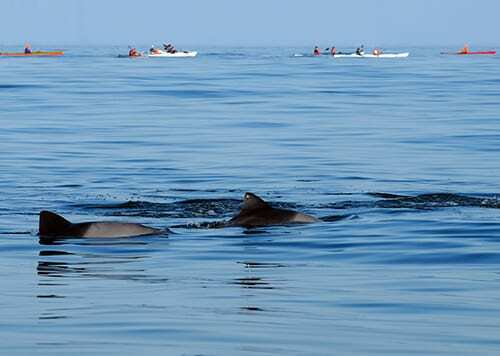 The relaxing and meditative qualities of the trip are punctuated by bursts of excitement as you see a pod of dolphins swimming by. In addition to dolphins, there are a number of seabirds that dramatically swoop into the ocean, or sail in groups above. Kayaking nature tours are accessible to everyone—from the novice to the more adventurous eco-tourist. If you’re someone who wants to try a new outdoor venture, to experience the ocean in a different way, then this is the trip for you. Spend the day on the water, and afterward, there are many ways to unwind on land. In Cocoa Beach, you could choose the standard restaurant and nightlife, or something a little special, such as relaxing on a pier, watching the sunset over the ocean as you relish in the afterglow of an exciting day.